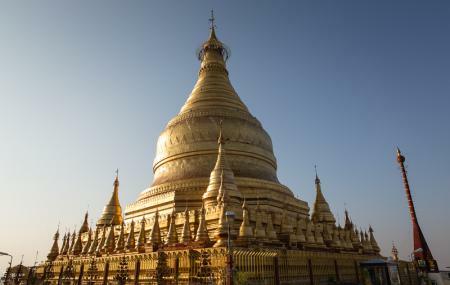 A Pagoda with an incredible view, that’s Tuyin Taung Pagoda or Tant Kyi Taung Pagoda for you! On your way to Mt Popa, you can break your road trip and enjoy some relaxed moments here. This one is situated at the top of a hill and hence the view it offers is just fascinating. When the sun is about to set and the sky turns orange, this is the best time when you can enjoy Tuyin Taung Pagoda beauty in the truest manner! Also, carrying a camera is must! How popular is Tant Kyi Taung Pagoda? People normally also visit Dhammayazika Pagoda while planning their trip to Tant Kyi Taung Pagoda. One of the distinct pagodas built by King Anawrahta. We had to reach the Pagoda by crossing the River Aeyawady by ferry boat arranged by the Bus tour operator in the Package to Bagan & around. It was a pleasant experience to cross the calm River. It took about 30 minutes to reach the base point of the hill housing the Pagoda. The second leg of travel is by a jammed van into which the tourists are packed - 16 in one load van with no seats! With a request for capture of scenes in my photography I was permitted to sit at the front driver side seat. The van took another 30 min up ( 20 min down ride). The van was parked at the foot of the Pagoda. We preferred to go by free lift to the level of Pagoda. After having a brief prayer at the Lord's abode we started enjoying the beautiful surroundings of plain+ hills view on one side and the River view on another side . There is also steps to reach the Pagoda through which we can view the Shrines at the lower reaches. The return trip also takes an equal time totalling half a day for the whole trip. Yet with adventurous experience it is worth spending the time . Computers in the classroom In recent years computers have become more useful to parents, teachers, and students because they have become faster and less expensive. Which is why computers can be found in most classrooms and can be useful to teachers and students. Many people feel that the time spent on computers could be spent on other things like one on one teaching or learning how to read and write. What people don't think about is how effective a computer could be to a child's education, and how computers can get students organized and willing to learn. In order to make computers more effective, teachers need to be trained on how to use computers, pick appropriate software, and get students involved in learning how to use the computer. For years computers have been used in the classroom to help in the overall education of students. Since computers help so much there needs to be a way to include the use of computers in a student's everyday life. In an essay by Tom Loveless he includes a report conducted by the U.S. Department of Education that states, "the proportion of schools reporting the use of at least one computer expanded dramatically in the 1980's, from about 30% of schools in 1982 to over 95% in 1988 (Why aren't computers, 2".) Loveless also includes a report conducted by OTA that states "in 1995, schools possessed an estimate 5.8 million computers, roughly 5.8 million computers roughly one for every nine students (2). The pagoda overlie on the TantKyiTaung very nice place.